Nice clean cut from the top. 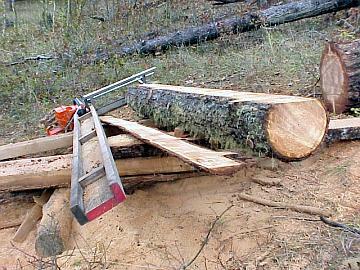 Green wood cuts much better than dry and is easier on your saw. On the other hand it will often develop checks (cracks) if it isn't kept out of direct sunlight. Rotating the beam as it cures helps also. Don't forget to paint the ends so the moister percolates out of the sides like the rest of the beam.